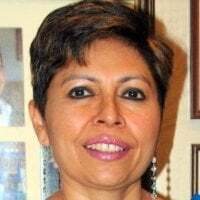 As a Learning Strategist, I have been involved in the creation of several compliance training courses in the last 12 years. In all these years, we have built compliance training courses for some of the leading global organizations in Financial services, Insurance, Healthcare and several others in varied manufacturing sectors. Almost always, the brief from the Compliance team is to lay the content "as is”, have forced navigation and get it done quickly with hardly any room for creative strategies. I always felt that the mandate was focused on meeting the “certificate of completion” rather than ensuring a “sticky learning”. However, now I do have a case study of a Compliance team that gave us the mandate to create an immersive learning experience using Gamification. The project was for a compliance training course to increase awareness on risk management and was intended for a global roll-out. 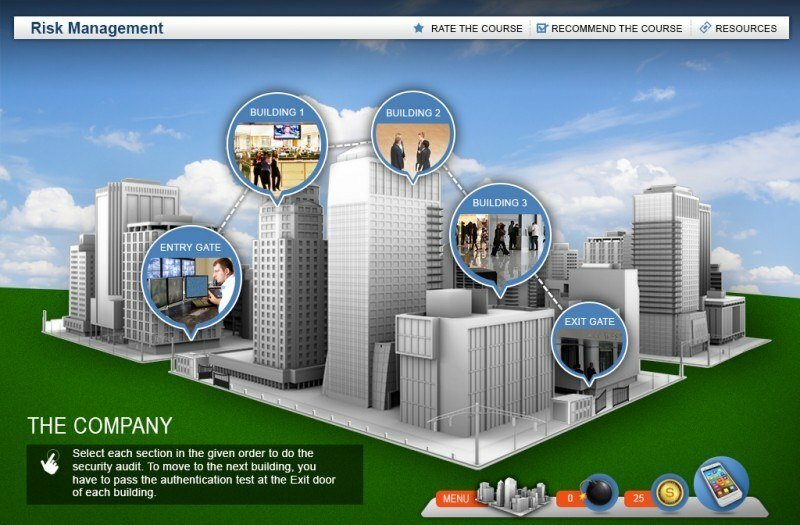 Furthermore, the compliance training course was to be designed for multi-device delivery. 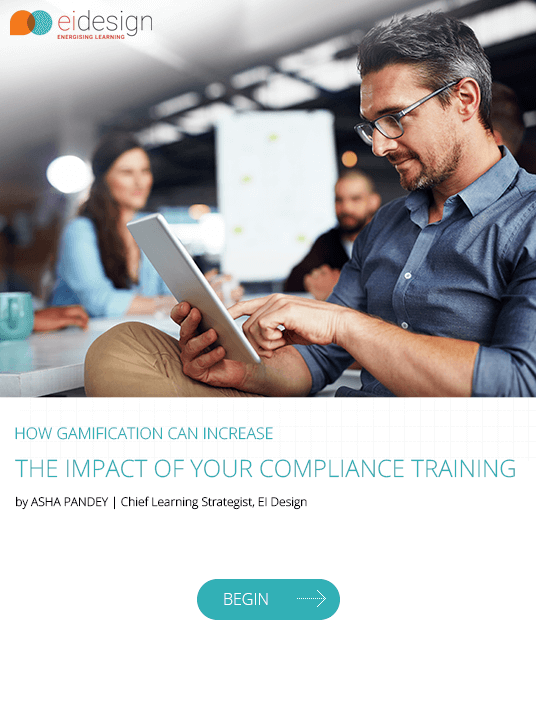 A thorough analysis on how to use gamification for making compliance training a joyful enterprise. There were inherent challenges in the content as it was rather dry. While we had a go-ahead for the Gamification-based approach, we needed to come up with a strategy that would retain the sanctity of the Compliance mandate (that is, no frivolous game-based approach). The Gamification concept must be challenging and at the same time rewarding. The game scenario/story must be contextual to the content. It must map closely to the learners’ work situation so that they would be easily able to relate to it and apply. The learning should be incremental at every stage of the course. 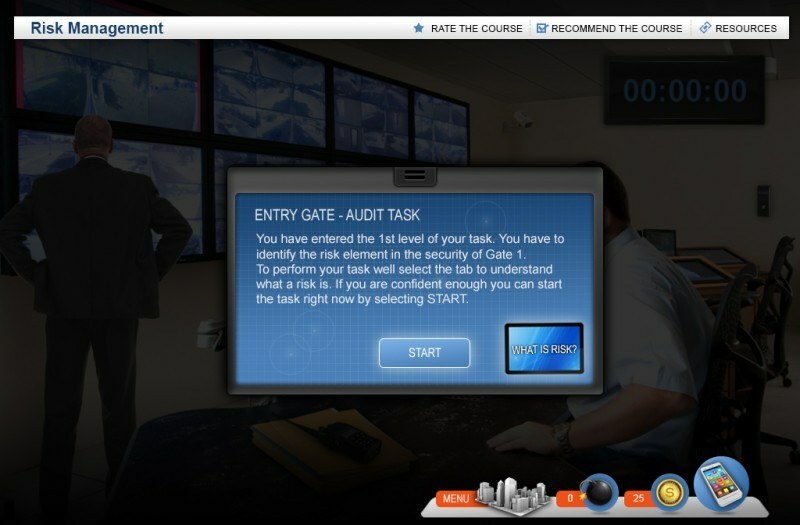 We created a simulation-based task-oriented Gamification course, which was interactive and engrossing. 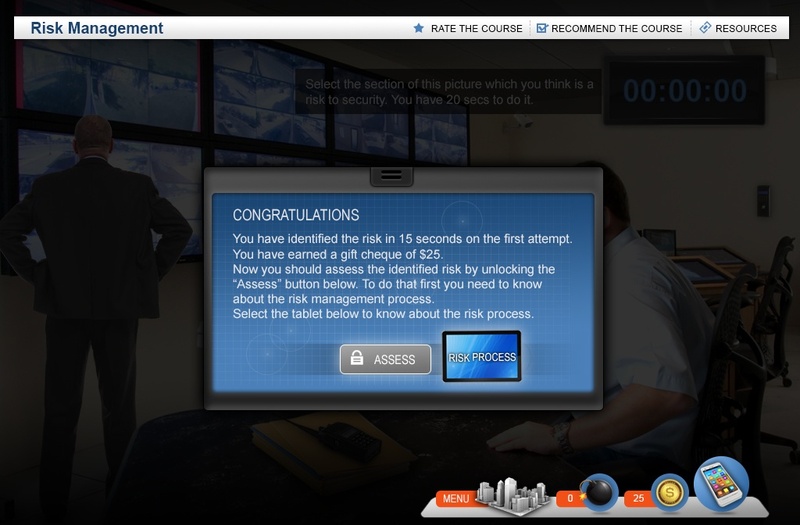 The game scenario was mapped to the context of risk management and the incremental learning was provided at each stage of the game as the learners took the challenges and overcame them. 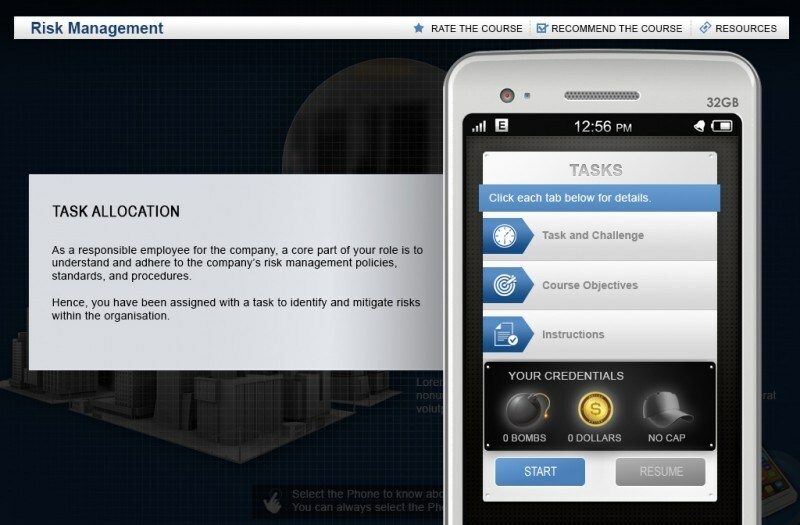 To achieve this, we incorporated a real work environment (visually), an element of challenge (bonuses and bombs), rewards for success (caps, badges) and learning through activities including elements of surprise and delight. We provided the learners the choice to seek support while performing the assigned task like in a real life scenario mapping to actual human behavior in such situations. This ensured a true simulated environment to encourage application of knowledge through performance. The learners could access any section of the game to perform the tasks and challenges. Each section was mapped to a learning outcome. The learners could look at the tasks and challenges which they had completed and were yet to unlock. They could also see the reward points in the form of dollar coins, bombs (signifying the places where the risk was still active) and bonuses earned. It gave them a sense of control on the proceedings. Before the learners took up a task, they had the choice to seek help to learn something related to the task they were about to undertake. 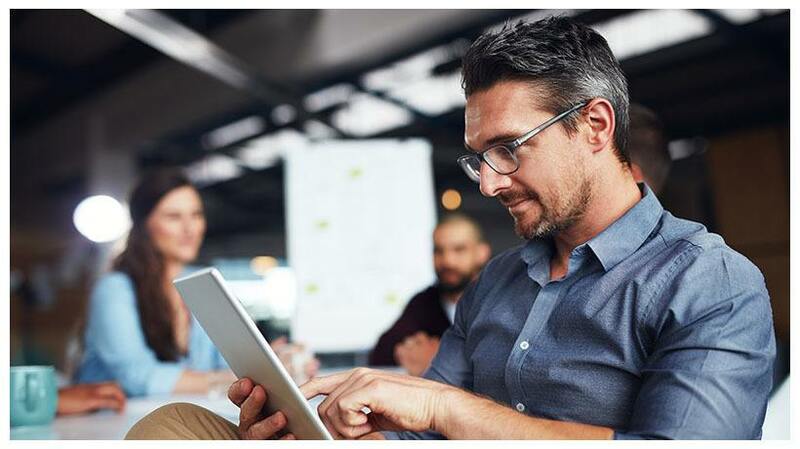 This served as a performance support solution for them and a just-in-time aid. The learners had to identify the risk in the situation presented to them in that location within a time period, which presented them with the element of challenge and competitiveness. They were given bonuses if they did it before the specified time period. If unsuccessful, they got bombs which they could neutralize by the dollars they earned during the game progression. The learners were given feedback on their performance based on which they could move on by unlocking the next challenge or by asking for support. I hope you enjoyed this case study on Gamification experience. I am very keen to know from people who are part of the Compliance mandate on how they feel about this strategy and if it would indeed serve their mandate better.